Let us take care of your gift list. The South Pacific County Humane Society “Gifts in the name of…” program is very popular at Christmastime. 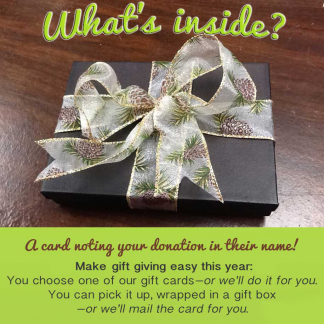 You make a donation of at least $10 per person, give us your recipient list with addresses, We wrap a holiday card telling them of your gift in an adorable box you can pick up at the shelter, or mail the card to the person. You, and they, get to help pets in need, your shopping is DONE and everyone is smiling. Nice, eh? 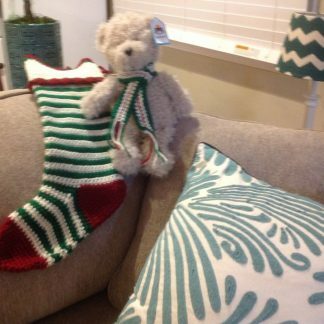 Who doesn’t need a homemade Christmas stocking? BJ will crochet yours in any size or color. Here are just a few of the items I’ve made in the past and would love to make for you. Contact me any time for a special order, pricing information, or to discuss your potential project.